Well, if you are in the camp that believes the Ivory-billed Woodpecker to be truly extinct, and all of those sightings down in the primordial swamps of Arkansas and Florida are really just Pileateds on steroids (or birders on steroids), then you would believe this to be our largest woodpecker. I myself am not so sure, but that's a topic I'll leave to the professionals to debate. The specimen I prepared was about the size of a crow, with large, powerful feet, a massive bill, and was collected from the Minnesota DNR. You won't be finding these coming through Chicago. 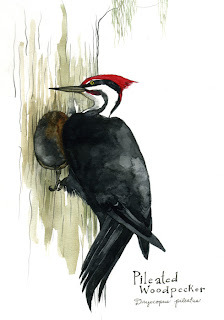 Pileateds prefer old growth forests and can be found in the swampy South, as well as the chilly, coniferous North. I saw my first on Orcas Island near Vancouver shredding the bark of a large tree, and a second in the Smokey Mountains. With their bright red crests, long neck, considerable wing span and bulk, they're a stunning sight. Even if you don't see one, you may come across their trademark: large, oblong holes chiseled away in trees. Love your version of this guy. We used to see these a lot as kids in the Blue Ridge. They really are very dramatic birds, and their call is unmistakable. During hunting season, they are one of the few sounds you'll hear in the woods, as everything else is hiding.